People are always asking what to do about ammonia problems. You know… that stink that burns your eyes! The little red bum that breaks your heart to see! I myself struggled with ammonia for a while. Like anything, it is super frustrating to see your little baby in any pain at all, even just a rash. Here are a few things you can do to help prevent it. And believe me, you WANT to prevent it because once you have an ammonia build up problem you will feel like you need explosives to get rid of it. Simple step 1: Rinse it out! We only had ammonia problems with our night diapers. But I recommend doing this for any diaper that has a lot of pee sitting in it for hours, so also nap diapers if you need to. Rinse the diaper out with hot water after using it and before you store in your wetbag or pail. You can do this in your sink and wring it out by hand. Or you can use your washing machine. I have a top loader and do a short cycle on the lowest water setting with hot water and only let it agitate for 3-4 minutes and then I let them go one spin cycle. Since I started this, we haven’t had any more ammonia burns on Sophia’s bum. 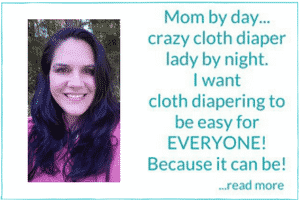 Simple Step 2: Use natural fiber inserts or diapers. We are talking about cotton, hemp, or bamboo blends. Two things make this effective. First, natural fibers don’t hold onto ammonia like a synthetic fiber (Microfiber). Second, natural fiber inserts, like hemp, tend to be thinner with less layers. This means that ammonia can be cleaned easier in the wash because there aren’t so many layers for the soap and water to reach. Simple Step 3: Wash more often. If you really have problems with recurring ammonia issues, you may need to wash more often to keep ammonia at bay. Washing more often, perhaps every 2-3 days, will give the pee less time convert to ammonia. Simple Step 4: Check your wash routine. Remember… keep it simple. I recommend using a WARM pre-wash cycle that acutally agitates (not all rinse cycles do this). The warm water opens up the pores in the fibers allowing more water in to hopefully rinse more of the ammonia away. Use enough detergent in a HOT wash cycle. *I use Tide and use the same amount of detergent I would for a load of the same size of regular clothes* The amount of detergent YOU should use varies depending on which detergent you are using and how much you are washing. Simple step 5: Keep your baby properly hydrated. Give them fluids like water or breast milk. Just as in adults, a well-hydrated baby will have less concentrated urine which means less ammonia. Just remember that children under 6 months should only get breast milk or formula. It can be dangerous if your baby drinks TOO much. Always check with your pediatrician about proper hydration amounts for your child’s age. If you need help with your wash routine, check out this post and come on over to our AACD Facebook chat group. We can help you troubleshoot the problem. 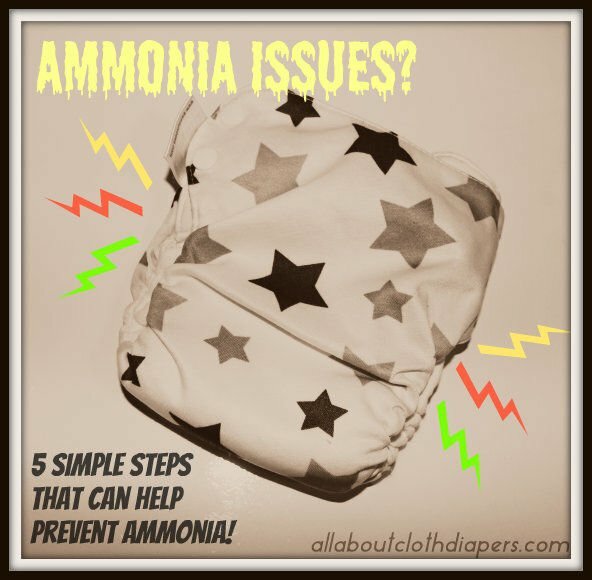 Do you have any other tips on how to prevent ammonia issues? Avoid Tide or anything with a history of animal testing. Currently Kirkland is working well for us. The simplest non toxic no scent detergent they make. I rinse then wash every 3 days. Start w/ 1/4 cup vinegar on Soak in the front loader. Then a Heavy Cycle with Hot and the Kirkland along with 1/4 cup more vinegar. Sometimes I do a final cold rinse to remove any excess detergent. Sorry for the off-topic question but which diaper is displayed in this post? With the gray stars? I think Rockin’ Green Soap Funk Rock is the best and easiest ammonia bouncer there is! I love that stuff. It always works like a charm for me. I love using the soap, too. Smashing Watermelons is my favorite! I’m so glad to have Rockin’ Green in my cleaning arsenal! Is there an entry for getting rid of ammonia? We ave been battling it for eat seems like forever. We moved last October and our water changed, I advent gotten back in control since, it seems. I need a tried and true way to strip out the ammonia from a collection of all different materials using soft water. I had an ammonia problem, I tried dawn to strip the diapers, I tried oxyclean, I tried vinegar, and nothing was working for me. Finally I bought some Funk Rock and it was wonderful! Now I put one tablespoon in with every load and I haven’t had any problems since. I do have very hard water at my house. I was about ready give up on cloth if I couldn’t find a solution. We just recovered from ammonia issues. When I asked for tips on the AACD facebook page, I was told to use the largest wash setting to make sure they were getting rinsed well, which I had not been doing before so I have been doing that now, along with a cup of vinegar in every other wash (I have a water softener, I know you shouldn’t do that if you have hard water). So far so good! I do all those things including using oxygen bleach, but every once in a while ammonia still creeps up. At first sign (or smell), I do an extra long wash cycle. I already use the longest cycle my machine does, so I just stop the cycle during the pre-rinse and let it soak for a few hours. Then I do everything else the same. This gives the detergent enough time to to do its job. Works every time. 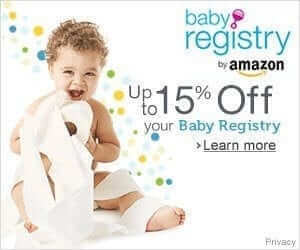 I found your site just after I’ve had a diaper stripping session. We woke up to a horrible ammonia smelling diaper last week and it seemed each diaper after that reeked also. I boiled my prefolds and inserts and cloth. I did several wash cycles with no detergent and I use our diaper sprayer always. I think we got the stink out but I’m doing a Dawn wash just in case. Glad I stumbled upon your site today. I’ll be coming back to read more. Have a wonderful day in our Lord! Thank you Ruthie! Welcome! Did you sign up for the email notifications so you know when we have a new post up? We also have a private group on Facebook where you can ask away with any questions you may have. https://www.facebook.com/groups/572823649405637/. I’m so glad you found it helpful Stacey! Using oxygen bleach has helped eliminate our ammonia issues. Yup, we use oxyclean free when we need a post to get things clean. Great tip Teca!